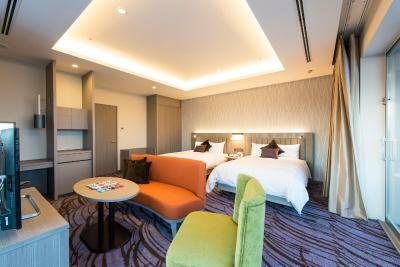 Lock in a great price for ANA Crowne Plaza Chitose – rated 8.7 by recent guests! That there is a shuttle from the airport to hotel and back. Good location near AEON , Near Airport . Free airport shuttle bus. Staff is good. We did not eat breakfast as our flight was very early. Good location as it is near the airport and your staff made sure we had free shuttle to airport. 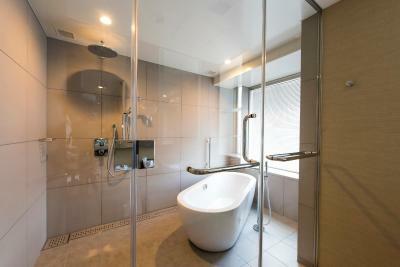 Bathroom is really nice and the room is very clean. I will definitely go back. What not to like about this hotel?! Staff was amazing, polite and always smiling, room spacious, clean, comfortable, fast internet, international TV programs, amazing bathroom.... it honestly exceeded my expectations. There is a Family-Mart within the hotel, which is really convenient. Airport transfer , family Matt downstairs, near by many restaurants ! V convenient! Had a layover stay at this place. Great place. The scheduled bus to the airport needs advance reservation. 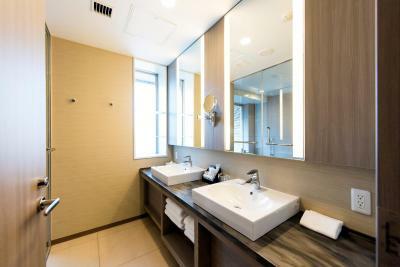 ANA Crowne Plaza Chitose This rating is a reflection of how the property compares to the industry standard when it comes to price, facilities and services available. It's based on a self-evaluation by the property. Use this rating to help choose your stay! 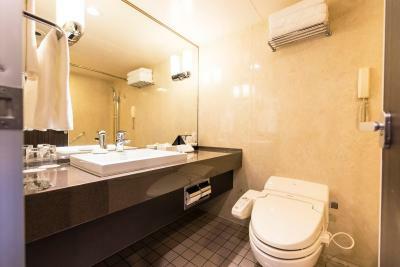 One of our top picks in Chitose.A 7-minute walk from Chitose Train Station, ANA Crowne Plaza Chitose offers air conditioned rooms with free internet and a private bathroom. The hotel features several restaurants and a karaoke room. Crowne Plaza ANA Chitose is next door to shopping center Posful, and a 4-minute walk from Grace Wine Chitose Winery. An airport shuttle is available to Chitose Airport, just a 15-minute drive away. 30 golf courses are situated within a 30-minute drive of the property. 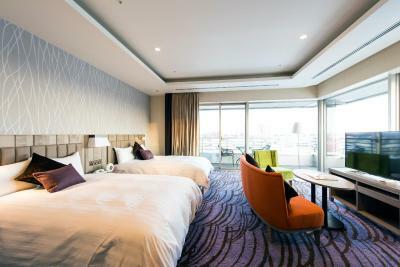 Guest rooms at ANA Chitose Crowne Plaza are equipped with TV, fridge and tea/coffee maker. The private bathrooms are equipped with amenities. Guests can shop at the hotel’s gift shop or pamper themselves in the hair and beauty salon. The hotel offers bike rental and coin-operated laundry facilities. Free parking is available. ANA Crowne Plaza Chitose features sushi restaurant Fujihana. Restaurant Haskap serves breakfast daily. Beverages and snacks can be enjoyed with city views at the 11th-floor Astral Bar. 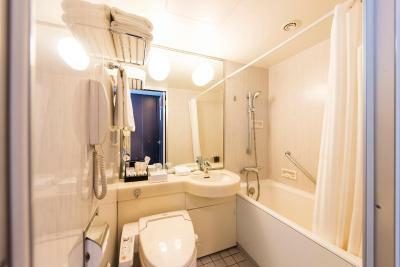 This property is also rated for the best value in Chitose! Guests are getting more for their money when compared to other properties in this city. 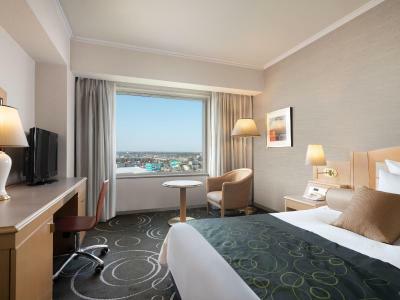 When would you like to stay at ANA Crowne Plaza Chitose? Room fitted with a TV, a fridge and an electric kettle. The private bathroom is equipped with amenities. Rooms will be assigned to guests upon arrival. Room types and smoking preference are subject to availability and cannot be guaranteed. This twin room has a balcony, sofa and satellite TV. This twin room features air conditioning, sofa and electric kettle. This quadruple room features air conditioning, tumble dryer and bathrobe. This suite features a bathrobe, tumble dryer and electric kettle. This single room has a tumble dryer, bathrobe and electric kettle. House Rules ANA Crowne Plaza Chitose takes special requests – add in the next step! ANA Crowne Plaza Chitose accepts these cards and reserves the right to temporarily hold an amount prior to arrival. Airport shuttles to Shin Chitose Airport departs at 06:20, 07:05, 07:50 and 08:35 from the hotel. Please note no pick-up shuttles are available from the airport to hotel. Nonsmoking rooms can be requested at time of booking, but availability is not guaranteed. The food was wonderful. Really really loved the food. nice staff, very good transportation to air port, on time!!!! The bath room door can only open two third, we tend to bang on it. Strange door design, I stayed in room 6615, n my daughter 6616. 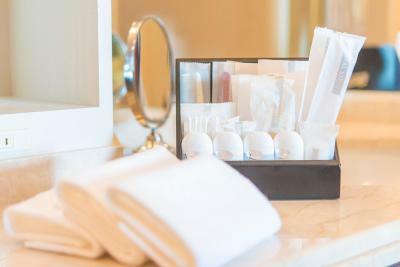 The small touch to make your stay a pleasant one. Even down to the fragrance of the shower gel. I think the fried chicken in the bar floor 11 wasn’t fresh . I was very sick all the next day .